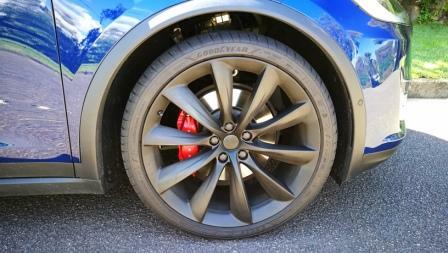 2017 Tesla Model X: A Wheel Thing Car Review. | | A Wheel Thing. 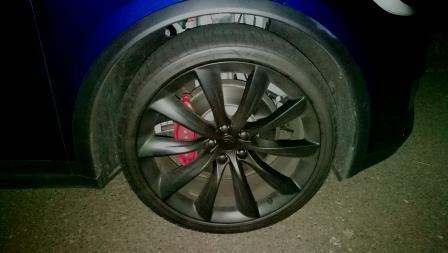 2017 Tesla Model X: A Wheel Thing Car Review. Being an independent reviewer means relying on the good graces of companies to allow their cars to be reviewed. 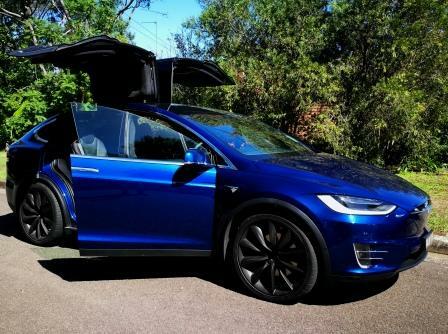 Tesla Australia is one of the companies that works with independent reviewers and A Wheel Thing was privileged to spend a too quick 30 hours with the new Model X. It’s jampacked with technology and comes with a pricetag to suit. 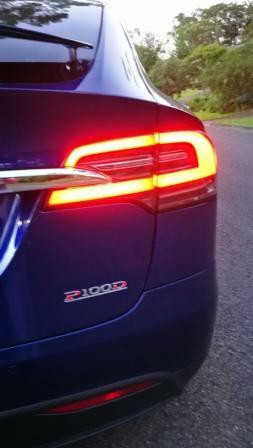 An immediately noticeable feature of the Model X is the strong family resemblance to the Model S. There’s a similarity to the profile, with the A pillar and window line providing a clear lineage. 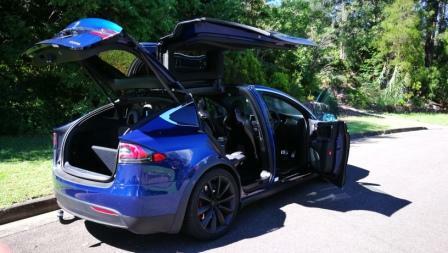 However, a major talking point of the Tesla Model X is the pair of upwards folding rear doors, known as “Falcon Wing”. What hasn’t been noised about is the tech that allows the doors to open in tight parking points. There’s sensors and cameras that will read the surrounding environment, with the cameras mounted discretely next to the rear wheels. The system works holistically and, when the doors begin their opening motions, will keep the doors from opening too wide or high. Maximum opening width is just twelve inches. The doors themselves are roof hinged, in the centre and have smoked glass, and will open outwardly slightly before commencing their vertical travel. The tailgate is powered, however the front doors, unexpectedly, are also powered. It’s here a surprise and delight feature comes into play. When walking up to the car (and ensuring the sedan shaped key fob is on you) the driver’s door will open in greeting. On a wet day this could be a godsend. The fob itself has a hidden button or two, on top and at the rear, which will open/close the tailgate and open/close all five doors. There’s even a spoiler that raises and lowers, ala Bugatti Veyron, hidden in the rear deck. Inside, the cabin is dominated by a touchscreen almost big enough to double as a TV. 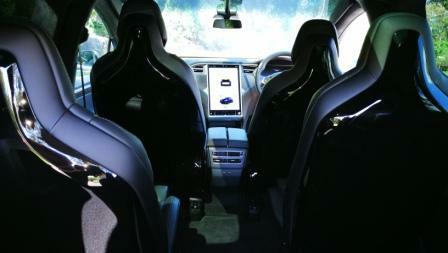 Sitting in a portrait orientation, this screen is the control centre of any Tesla car, offering information, accessing over the air updates (as was the case during the brief time it was with A Wheel Thing), accessing apps and the radio system and providing startling clarity when using Google Maps. Although given a demonstration by one of the wonderful staff at Tesla’s main Sydney location, the amount of info and how it all operates is somewhat overwhelming, even for a fairly technically literate person. The radio itself is only FM, no DAB, but has TuneIn to compensate. There’s something just a little bit awesome about being able to listen to bluegrass from Georgia in the U.S. or a dedicated Beatles station in Sweden. Audio quality itself is excellent, with the Mark Levinson speakers delivering real clarity, superb low down punch, and vocals that are clean and crisp. There’s a couple of nice touches to the interior. 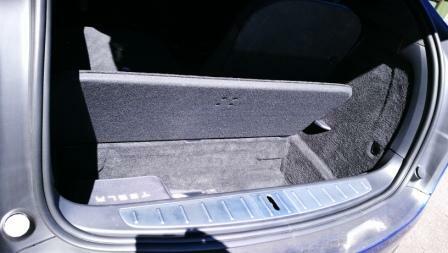 The seats are powered for rear and forward motion at the front, however the middle rows are also powered and have a setting which allows for them to power forward to a certain point to allow access to the second row rear seats. It’s diabolically simple in opertaion and makes utilising both the seats and the door access unbelievably simple. 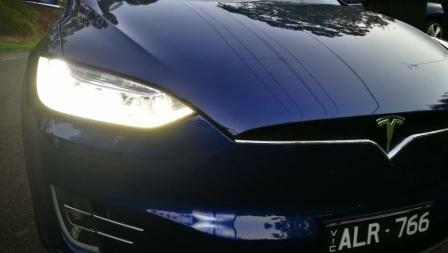 There’s also a huge sloping windscreen which provides a huge amount of forward and upward vision. Fear not, dear driver, you won’t fry like a piece of fresh bacon, for Tesla have embedded enough tint to block UV without losing the wondrous panoramic view. There’s even some tasteful looking carbon fibre trim added in. At the rear left quarter is the housing for the charging cable. 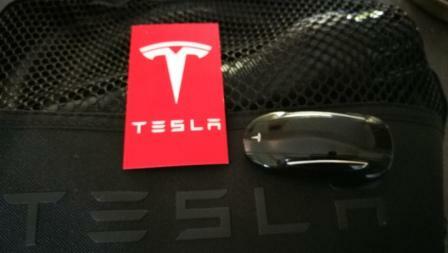 Tesla provide an adaptor to suit standard household plugs along with, of course, those that choose to get a supercharger installed at home. Again, it’s just a touch fiddly to get the small hinged flap to open but the actual process of hooking up the cable and seeing a hidden LED glow green to indicate charging is relatively simple of itself. 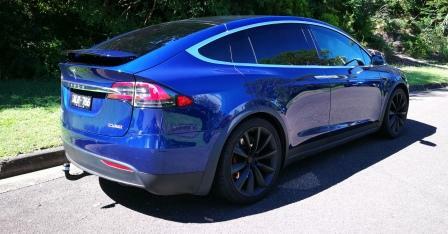 Be the first to comment on "2017 Tesla Model X: A Wheel Thing Car Review."